Personalize your smartwatch with this appealing Nomad leather Apple Watch strap. Embellished with black stainless steel lugs and a coordinating buckle, this Nomad leather Apple Watch strap gives your device a classic air. Trending at $18.69eBay determines this price through a machine learned model of the product's sale prices within the last 90 days. GORGEOUS COLOR- this is made to look already broken in. However, I am only human and could occasionally miss a minor flaw. I would appreciate all 5's. Open box, never used. Box can have scratches, scuffs, stickers from the shelf handling. 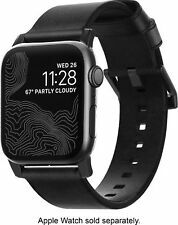 Nomad - Sport Watch Strap for Apple Watch ® 42mm and 44mm - Slate gray on black. Slip your smart watch onto your wrist with this Nomad strap. The gray hue and sporty style make it easy to wear your 42mm Apple Watch daily. 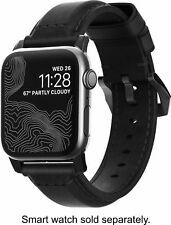 Nomad - Modern Strap Leather Watch Strap for Apple Watch fits 1234 models 42mm Condition is New. Shipped with USPS First Class Package. Trending at $28.99eBay determines this price through a machine learned model of the product's sale prices within the last 90 days. Customize your Apple watch with this Nomad leather watchstrap. Showcasing sleek black accents, this Nomad leather watchstrap combines classic style with a modern finishing touch. Nomad - Modern Leather Watch Strap for Apple Watch ® 42mm and 44mm - Slate gray with black hardware. Nomad - Modern Leather Watch Strap for Apple Watch ® 42mm and 44mm - Brown with black lugs. Keep your 42mm Apple Watch in place with this Nomad band. The brown leather provides a comfortable fit on your wrist, and the custom hardware holds up to daily wear. Compatible with Apple Watch 42mm, 44mm; horween leather material; buckle. Designed for Apple Watch 42mm, 44mm. Model Compatibility: Apple Watch 42mm, Apple Watch 44mm. Fits for Apple Watch Series 1, 2, 3, and 4, featuring Horween leather with hardware. Hello and thank you for looking at my item the item featured above is brand new, never used still in a sealed retail package. We are offering this at a steep discounted price looking to move Surplus inventory. This item will ship fast we strive on customer satisfaction. In some cases expect the retail packaging to show some wear. The item will ship in its retail packaging if you have any questions or concerns feel free to ask. Please check out our other items. You never know what you may like!! Nomad - Modern Leather Watch Strap for Apple Watch ® 38mm and 40mm - Brown with black lugs. Wear your tech stylishly with this Nomad leather Apple Watch band. Nomad Leather Watch Strap for Apple Watch 38mm. Nomad Leather Watch Strap for Apple Watch 42mm Brown. Condition: New other (see details). Customize your Apple watch with this Nomad leather watchstrap. Showcasing sleek black accents, this Nomad leather watchstrap combines classic style with a modern finishing touch. This Modern Build leather strap is designed to give your Apple Watch a classic yet bold look that's uniquely yours.